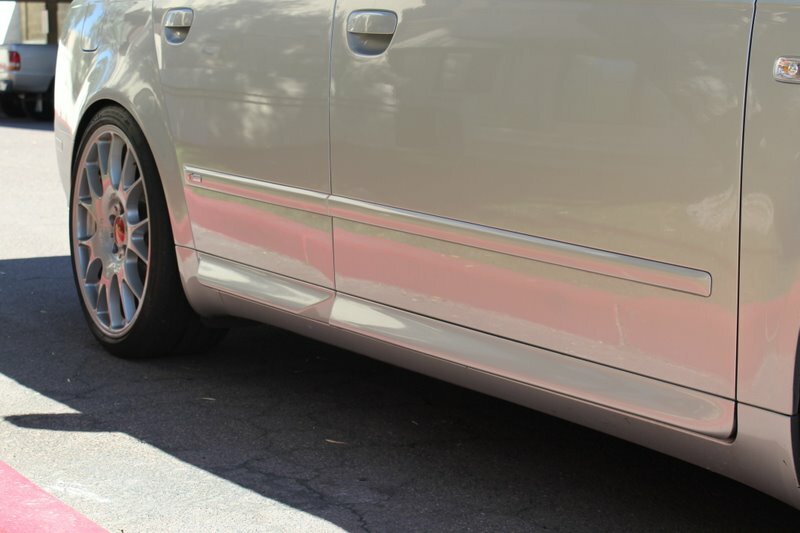 Audi A4 Door Blades – completely flat and they do not poke out from the side skirt at all. Audi A4 S-Line or USP (Ultra Sport Package) Door Blades – these look like the S4 door blades (above) only smaller and less aggressive. Audi S4 Door Blades – the most aggressive of the three, these door blades stick out the furthest from the body and have the sharpest angles. To install or swap door blades from one style to the other is very easy – all you need is a phillips screw driver, and you can swap out all four in under 20 minutes. There are two screws on the bottom of the door, which is all you need to remove, and then the door blade slides out. Here are a few pictures & step by step instructions on how to install & swap out a door blade (it is the same for all four doors). Step 1 – Remove the two screws on the bottom of the inside of the door. One is on the outside edge, one on the inside edge. Step 2 – Slide out the door blade. 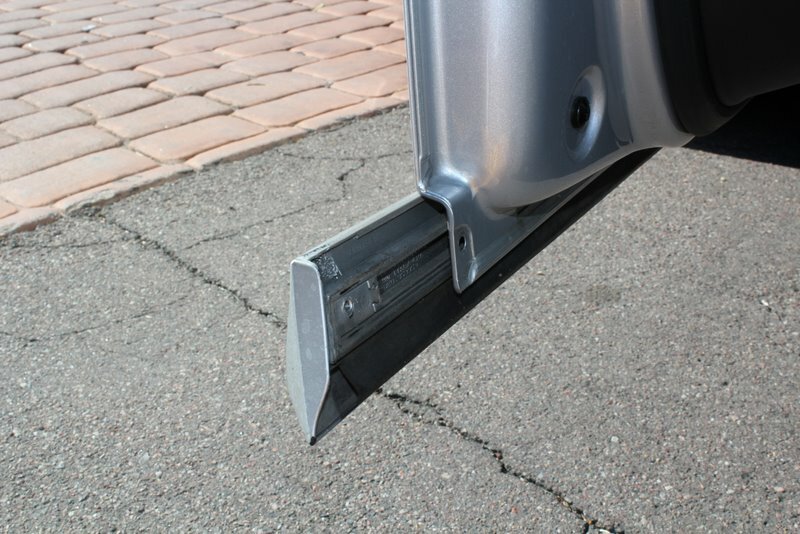 The door blades slide in and out, so simply pull the door blade outward away from the car when the door is open and it should slide 4-5 inches and the fall off. Step 3 – Slide on the new door blade and insert & tighten both screws again (basically, steps 1 & 2 in reverse). You’re done! Installation is easy and there is no doubt the door blades add an awesome visual effect to the car, whether you’re going for a clean & stealthy look with the flat door blades off of a standard A4, or a super aggressive and sporty look with door blades from an Audi A4. The Eurogear carbon fiber door blades screw in to the existing holes and come with their own screws, so you can follow the instructions above. The only downside is that you do have to drill one extra hole for a middle support screw, if you’d like to use that. Here are some installed pics thanks to Carlos T on his Imola Yellow S4. Ebay – you can buy OEM and aftermarket S4 blades on eBay. I recommend going the OEM route, but if you have a good body shop the aftermarket ones could be a good route too. Junk Yards – if you get really lucky, you can find a set on a wrecked Audi in a junk yard. Since they’re so easy to remove, you can pick-n-pull the part yourself and usually get a very good deal on it assuming the junk yard doesn’t know what they’re actually worth. The hard part is finding wrecked Audi A4/S4s, especially if you’re looking for one in the same color. Audi Dealerships – talk to your local Audi Dealership and see what kind of price they can get you…chances are they can’t beat ECS Tuning’s price, but its worth a shot. And that’s my guide to Audi A4/S4 lower door blades. 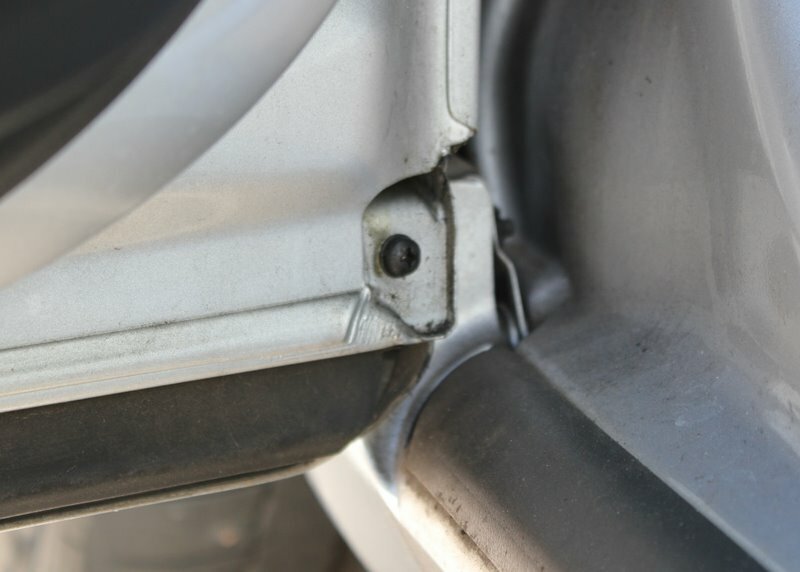 This subtle part can really transform the side view of your car, and they’re easy to install – the only downside is their price. If you’re patient, keep your eyes peeled for some used door blades, otherwise, be prepared to spend around $500 for a new set, and probably another $250 to paint them. Some people do leave them unpainted in flat black, which can look really cool & aggressive on some cars, but that’s a matter of taste & preference. I like ECS Tuning’s offer of free shipping. By the way, they give really cool look to already cool car. That is a great how to on how to swap the door blades. I can’t afford an audi, but if I could, I would definetely spring for the blades and vary them up! 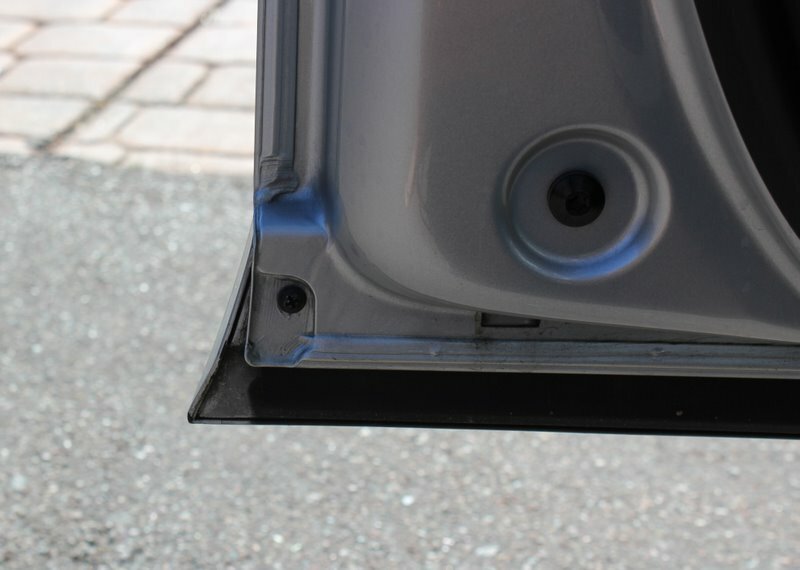 The standard door blades on a b6 are exactly the same as described in this post – remove the two screws at the bottom of the inside of the door and then they’ll slide out. Hope that helps! Actually, ECS Tuning’s prices are usually pretty awful. A little bit of google and you can destroy their pricing. 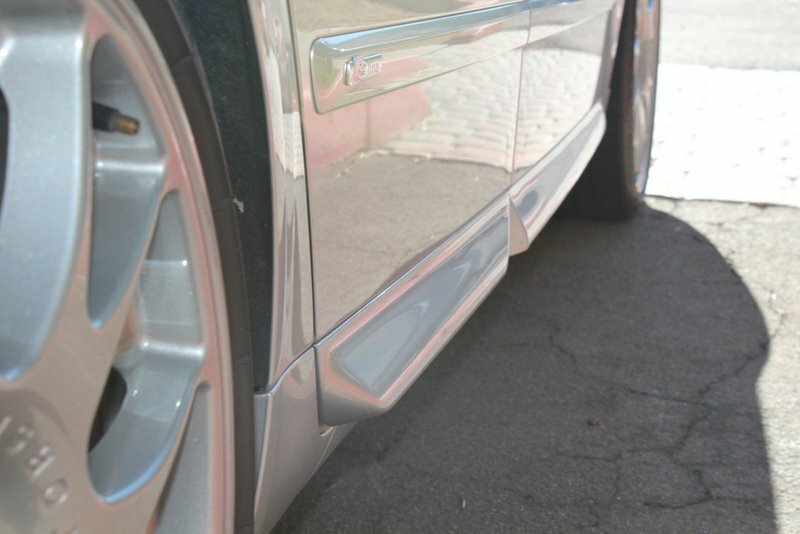 Hi 🙂 Does the b7 doorblades fit on an B6 Audi a4? Yes, for sedan & avant anyway. Convertible is its own beast. Great post even after all these years! Great job! I just bought the carbon fiber set from EuroGear. The instructions mention adhesive tape besides the screws, but there is no tape. Do stock ones have tape as well? Also, what about the rubber weather strip? Euro’s don’t have any, though looks made not to need it. Any input on these before I install? On Matthew’s carbon blades, I would recommend seeing if retrofitting the rubber weather stripping is possible, if they are loose then the vibration and movement will affect the paint and wear cracks into the paint which in time will allow moisture to seep thru to the metal skin. I would not trust double sided tape a sit may prove to be very difficult to release over time when you need to clean in between the blades and lower door panels. Just ordered a set from Eurogear to replace worn blades that are bowing too much. Felt better deal and more unique to tie in with rear carbonfiber spoiler. Have you seen any of the Eurogear pieces installed yourself? Do they use the factory screws to mount in place? Seemed like they were reputable since the were Sema recognized. Anyways looking forward to them on my 05.5 Imola Yellow S4 sedan and to change it up a bit. A neighbor of mine has the Eurogear blades, they seem to fit well – and they’ve been on the car 4+ years and seem to be holding up well. I kind of recall them not using the factory screws though, but I’m not 100% on it…but quality seems good. I do love me some Imola Yellow, post a pic after it’s installed to my FB page! Hey Nick! I have rusting on my 08 RS4 front passenger side. Can you help me with the part number? Sent you an e-mail with a few pics of my 05.5 Imola Yellow sedan with the Carbon-fiber door blades installed I recently ordered. I don’t use Facebook to post there. Figured you could post them where you like & also cause there are too few pictures floating around with these installed to give people an idea. These are the Eurogear ones I messaged last about.